You are currently browsing the Archaeofacts.com archives of Musings for the day Saturday, February 18th, 2006. 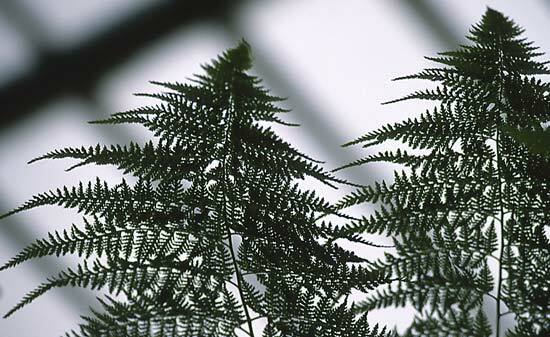 A fern at Kew Gardens, London. A fern at the ABG. John and I have been combing through our slides, sorting out a few keepers for scanning, continuing our shift to digital images. Once upon a time, we visited Kew Gardens on a rainy winter day at the end of January 1999. 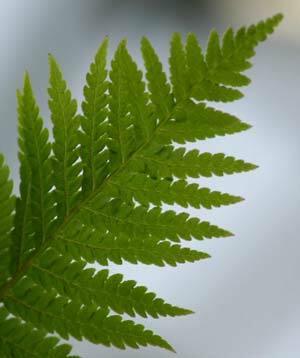 I did not remember that I was even then fascinated with the lacy look of fern fronds. I find that when we visit the Atlanta Botanical Garden (always a worthwhile urban escape!) and I commandeer the camera in the conservatories these days, I am drawn to the ferns (well, and the orchids, and the…). Part of it is the delicate edges, and I suspect another part of it is their long history of survival on this fine planet. Indeed, I remember staring at painted ferns in the backdrops of dioramas at the Michigan State University Museum, more fascinated with the vegetation than with the fossils or stuffed animals in the foreground. Trivia: my favorite fern name is Polypodium polypodioides, also known by the more prosaic name Resurrection Fern; it grows across eastern North America. I remember first learning its name from specimens in North Carolina aeons ago when I was working on the Haw River excavations.